Pro-gard is proud to introduce the GMM001 Motorcycle Gun Rack for AR style weapons! The ability to carry a concealed AR has long been a challenge for motor patrol officers. Pro-gard has the solution with our new Motorcycle Gun Rack that easily conceals an AR in the saddle bag. It is designed to fit the Harley-Davidson® FLHP Series, high-side saddle bag. It puts an AR within easy reach when the officer dismounts the bike. Motor officers can easily conceal an AR weapon with Pro-gard's Motorcycle Gun Rack. 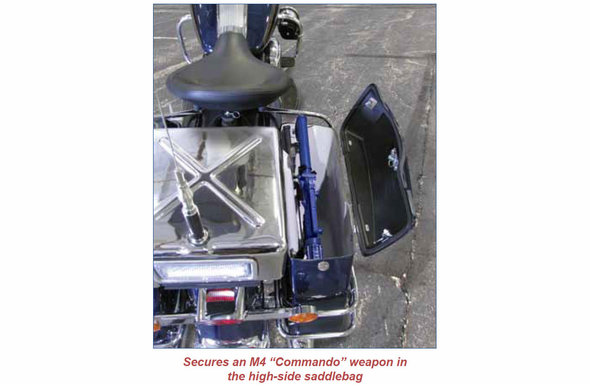 Designed to nest inside a Harley-Davidson® FLHP Series saddlebag, the gun rack can hold up to a 27.5" Colt M4 "Commando" weapon or variant with collapsed stock. Rack can hold an additional loose magazine for easy access. Mounts in high-side saddlebag only. Perfect for the popular Colt "Commando" M4 Carbine or other variants. Like all of Pro-gard's Gun Racks, this rack comes with an 8-second timer and momentary switch to prevent access to the gun when the officer has stepped away from the bike. The switch can be mounted in a concealed location to further hinder unwanted access. Pro-gard's unique design offers a universal holder for an additional magazine that is easy to grab when the situation demands. A charging bracket prevents the weapon from sliding out of the rack. The rack is made of durable, powder coated steel to resist corrosion and moisture from the elements. Points of contact are lined with foam to decrease potential "road-rattle." It mounts using existing slots and bolts in the saddle bag for a quick and easy install.